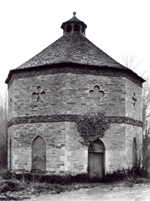 Having been constructed as a luxury food source in the 18th Century, the Dovecote fell into disuse in the 20th century, and while superficial repairs were undertaken, the quality of the building was decreasing. The Dovecote was first listed at Grade II by English Heritage in 1986, and this was upgraded to Grade II* in December 1996, citing that the Dovecote was possibly designed by Richard Woods or John Wood the Younger. However, further investigation suggests that the Dovecote was not constructed till 1780, separating this from the original design and construction of Buckland House. In 1995 the Dovecote was purchased from the Buckland Estate as part of Home Farm, a group of derelict farm buildings. An excellent site detailing the history of British dovecotes in general may be found at Historic Buildings in the British Isles. Sadly the Dovecote at Buckland did not feature on their tour.